New York Gov Andrew Cuomo is calling up an additional 1,000 National Guard troops, doubling the Superstorm force he initially thought would be enough to deal with the impending mayhem due to hit the city. Andrew Cuomo says the troops will be used to prepare for a possible historic storm surge and to contend with widespread damage and power outages caused by Hurricane Sandy. He already called up 1,000 National Guard troopers on Sunday, saying today the “cruel irony” is that the state is better prepared now because of last year’s tropical storms. The Army Corps of Engineers says the state is very well prepared and more bridges and tunnels around the city are expected to be closed at 7:00 p.m.
Police evacuated the area surrounding a super luxury high-rise under construction near Carnegie Hall as a rooftop crane dangled precariously in the wind on the roof. Police have closed off Seventh Avenue between 58th and 55th Streets. All occupants of buildings on West 57th Street between 6th and 7th Avenues have been advised to move to the lower floors. 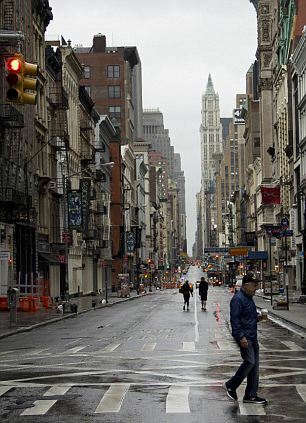 The streets were deserted from early this morning after 375,000 people were evacuated from their homes, subways stopped and shops and businesses closed in preparation for what is thought to be one of the worst storms in history. A 14-foot wall of water is expected to pummel the east coast after 5:00 p.m. today and residents are bracing themselves for winds of up to 90 mph – with the tunnels in and out of the city shut down at 2:00 p.m.
Subways, schools and the stock exchange will be closed tomorrow as well. The National Weather Service is reporting 24-foot seas off New Jersey after the storm continues to gather strength as it barrels across the Atlantic. LILCO reported more than 115,000 customers on Long Island were without power from Monday morning. Con Edison said at least 21,000 customers in New York City and in Westchester County are without power, while in upstate New York, 10,600 customers are affected. Two key tunnels connecting Manhattan to New Jersey and Brooklyn would be closed later on Monday ahead of the hurricane. Andrew Cuomo said the Holland Tunnel, which opened in 1927 and remains one of the main connections between New Jersey and New York City, would close as a precaution at 2:00 p.m. The Hugh L. Carey Tunnel, known locally as the Brooklyn-Battery Tunnel, will also shut down at the time. New York City bridges will remain open for now, he said at a news conference. Those on the upper floors of high-rise buildings are getting ready to be evacuated because the winds are going to be significantly stronger than those near ground level. An alarm was raised after a crane on West 57th Street collapsed on to a 75-story building. New Yorkers spent most of yesterday cleaning out grocery stores as they stocked up on water, batteries, candles and essential food items.